Here at comparethetreatment.com, we like to think we always have your best interests at heart. As a trusted, valuable and easy-to-use educational website that is designed to help you navigate your way safely to hundreds of cosmetic treatments and the clinicians who offer them, we now wish to add a little extra to ensure you always look your best. We have teamed up with the lovely people at Philips to enhance your experience when booking a consultation via our website. You will receive a FREE Philips EasyClean (RRP £90) with every treatment booking via Comparethetreatment.com. 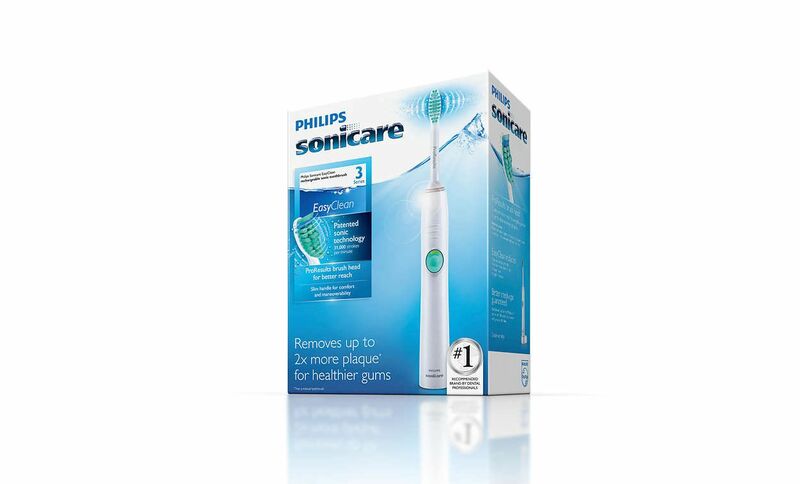 The Sonicare EasyClean toothbrush epitomises the Philips’ technology-driven healthcare ethos by offering all the benefits of sonic cleaning – high-speed bristle motion and dynamic fluid action – to achieve a healthier mouth. The brush is designed to make the transition from a manual to a power toothbrush that much easier. EasyClean has sleek, clean lines and has been designed with a simple on/off button and easy-start mechanism to gently introduce you to the sensation of sonic brushing. It also provides failsafe timed brushing, thanks to an on-board ‘smart timer’, which automatically measures brushing in four equally phased periods to ensure consistent and thorough cleaning for the professionally recommended two minutes your dentist or hygienist has suggested is optimum for twice daily brushing. The EasyClean brush includes the innovative ProResults brush head with its dynamic bristle motion designed to gently push fluid between the teeth. This combination of sonic technology and the unique brush head action has been shown to remove more plaque than a manual toothbrush – especially between the teeth. The brush is particularly designed to appeal to you if you are currently a manual toothbrush user, but have been told you could benefit from improved cleaning. Philips believes that once you have switched to a Sonicare toothbrush you will experience a new level of clean and ditch your manual toothbrush once and for all. Designed for the very oral hygiene conscious – beauty treatment lovers as well as the groomers among us – the Sonicare is also perfectly placed to meet the needs of those who are struggling with effective brushing. Want to be one of the ‘smart’ crowd? With an estimated 3.5 billion electric toothbrushes sold worldwide last year, we want to share our love for the Sonicare while offering you a safe place to discover the perfect cosmetic procedures for you – as well as the ideal and trusted clinician. As Comparethetreatment’s oral health expert and dental hygienist, Anna Middleton, says: ‘You get a far more superior clean and effective plaque removal because you get more brush strokes per minute than you could ever generate yourself with a manual brush.